Take a chance and win a free trip to Mars. 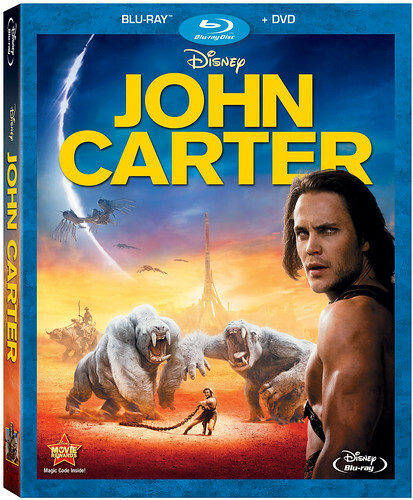 Cinema Sentries and the Walt Disney Company have teamed up to give one lucky the reader the opportunity to win a John Carter Blu-ray Combo Pack, which is now currently available to consumers in a vareity of formats. In addition to the two-disc combo pack (1 disc Blu-ray, 1 disc DVD), there's a four-disc combo pack (1 disc Blu-ray 3D, 1-disc Blu-ray, 1 DVD, and 1-disc Digital copy), a one-disc DVD, as well as digital versions available in 3D High Definition, High Definition, and Standard Definition. Based on Edgar Rice Burrough's A Princess of Mars, the first in an eleven-book series, the film tells of the adventure of John Carter (Taylor Kitsch), an American Civil WarConfederate Army soldier, who finds himself in the middle of a civil war on Mars. John Carter was the live action debut of director/co-writer Andrew Stanton, who was instrumental in much of Pixar's success over the years as a co-writer of the Toy Story and Monsters franchises as well as a writer/director of Finding Nemo and WALL-E. There are three ways to enter the contest, which is only open to residents of the continental U.S. For your first entry, simply retweet the following post on Twitter: Tweet this. For a second entry, "like" us on our Facebook page and leave a comment under the John Carter contest post. For a third entry, leave a comment below. The contest closes on Friday, June 8th.